The 2011 Lyrid meteor shower will pepper the night tonight between late night and dawn (April 21/22). However, the more likely peak night will be tomorrow (April 22/23), from late night Friday until dawn Saturday. However, you may see nearly the same number of meteors tonight. However, these meteors will be flying in the light of a bright waning gibbous moon. The moon will rise around midnight tonight, wiping all but the brightest Lyrid meteors from view. Still, a single meteor streaking along in a moonlit sky is also worth seeing. Keep an eye out. If you are up at dawn, though, you will see something for sure. 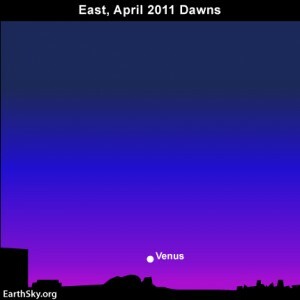 It is a dazzling world that the moonlight and the glow of twilight cannot extinguish – the planet Venus, above your eastern horizon about an hour to 45 minutes before sunrise. Venus will be low in the sky, so you will need an unobstructed horizon to see the third brightest celestial body in all the heavens, after the sun and moon. When there is no moon to ruin the show, the Lyrids often display about 15 to 20 meteors per hour at their peak. The Lyrids are not an altogether predictable shower, however, and in rare instances can bombard the sky with close to 100 meteors per hour. About one-quarter of the swift Lyrid meteors exhibit persistent trains – ionized gas trails that glow for a few seconds after the meteor has gone. 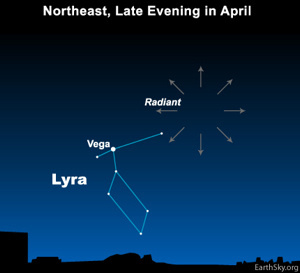 These meteors appear to radiate from the constellation Lyra, not far from Lyra’s super-bright star Vega. But this is only a chance alignment. The Lyrids – bits and pieces from the Comet Thatcher – burn up in the Earth’s atmosphere about 100 kilometers (60 miles) overhead, while Vega lies some 25 light-years away. However, you do not have to find Vega to watch the Lyrid meteors, for these meteors shoot all across the sky. Tonight and tomorrow night, the Lyrid meteors streak the sky from late night until dawn. The highest number of Lyrids usually rain down in the predawn hours before sunrise, but this year the bright moon interferes with the 2011 Lyrid display. If you want to try to catch a Lyrid meteor scooting along in the bright light of the moon, find a dark, safe spot and an open sky. 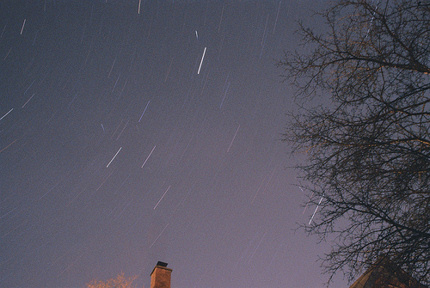 Meteor showers, like sporting events, have spurts and lulls, so give yourself at least an hour of viewing time. And remember – although the moon drowns out all but the brightest Lyrid meteors, the planet Venus will be beaming boldly in the east in the hour before sunrise! Site contents copyright © 2019 Recorder Online	except as noted. All rights reserved. | 83 queries in 1.102 seconds.